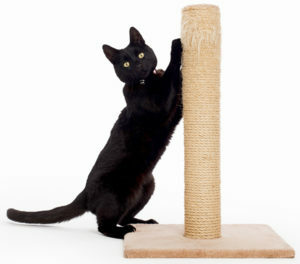 Cats like to scratch things – it’s a natural instinct – but it doesn’t have to a be a problem if we provide options. Make sure you have acceptable objects in strategic places. Many scratching posts have catnip under the outer material, and cardboard scratchers often come with a bag of catnip to sprinkle on. This makes the acceptable object more interesting to the cat. Keep the unappealing coverings until your cat has used the “right” object in its permanent location for abut a month. A cat’s nails grow as fast as a human’s. If you have an indoor cat, trim front and back nails every month, starting at abut 8 weeks of age, so you both get used to it. 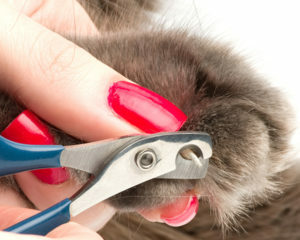 If you can’t do it yourself, take your cat to a groomer for regular nail trims. It’s inexpensive and prevents problems with scratching. Look at the nail from the side to determine where the nail ends and the quick begins. Cutting the quick will cause pain and bleeding – it’s better to just trim the tip of the nail.